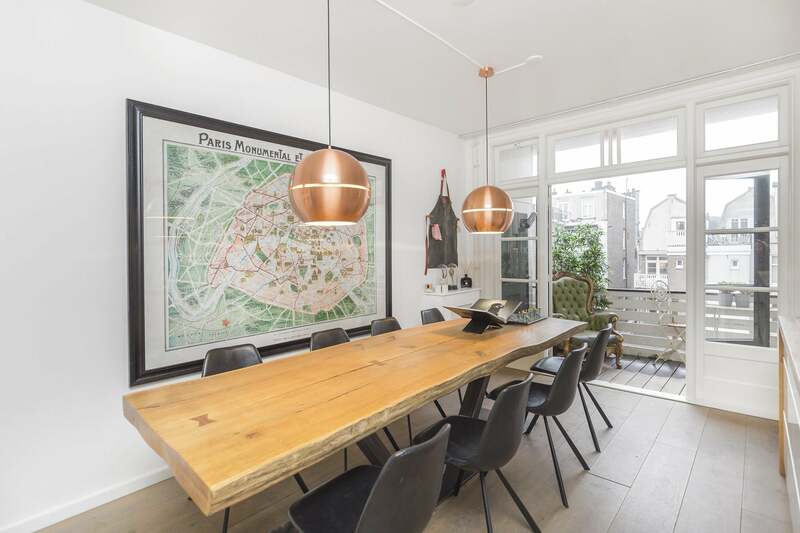 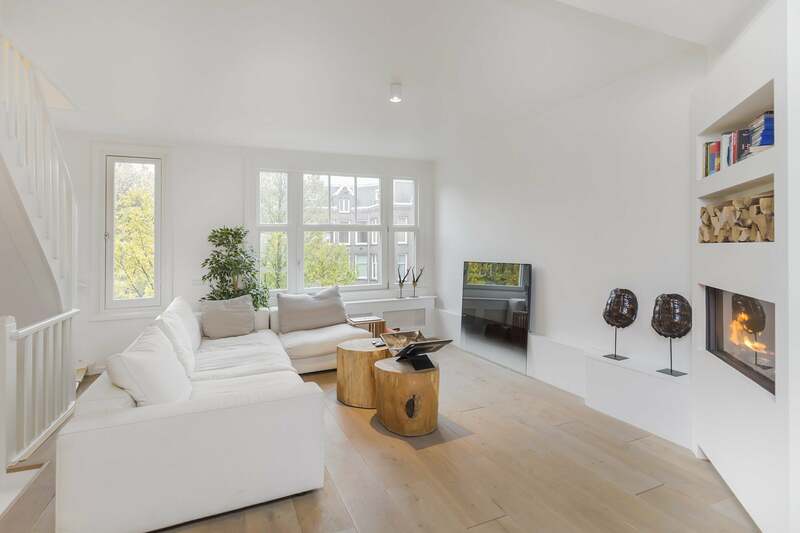 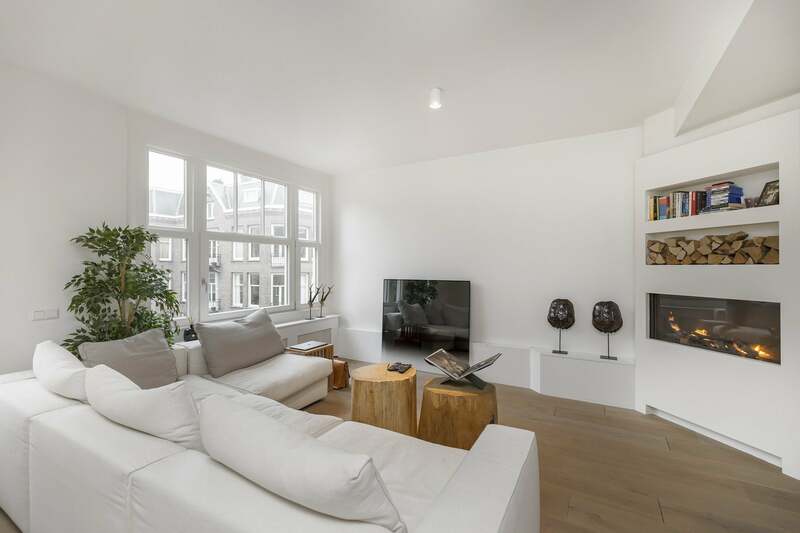 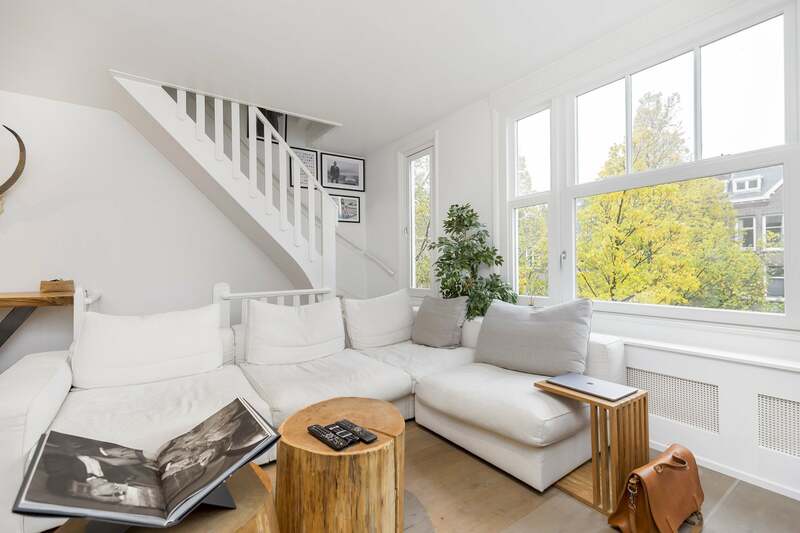 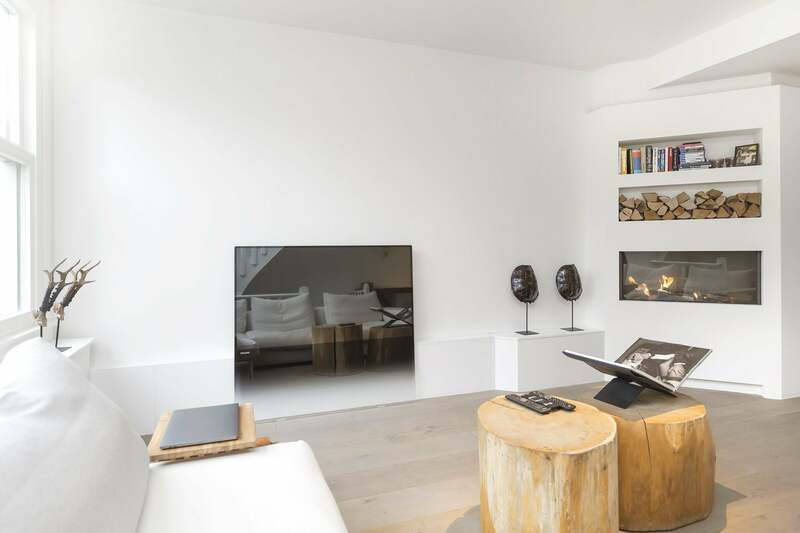 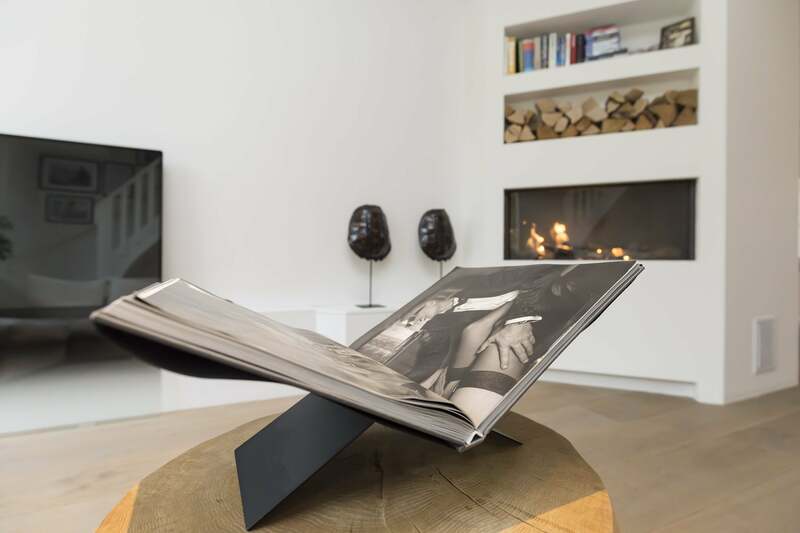 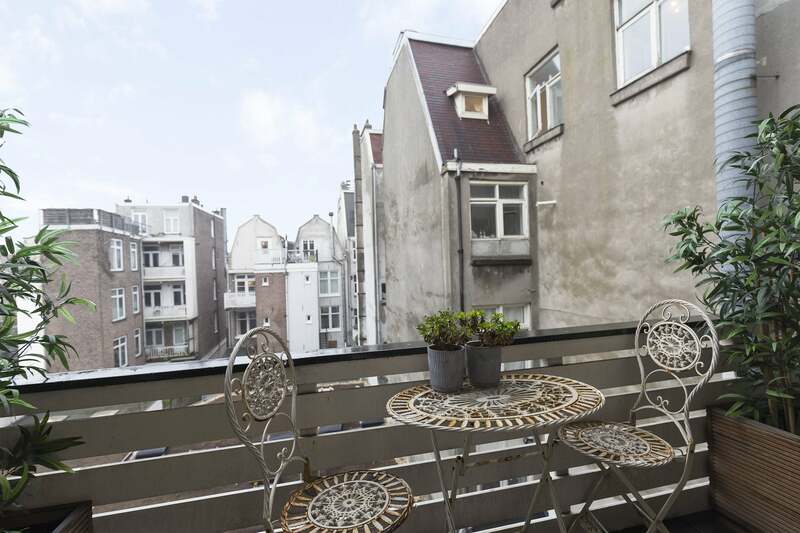 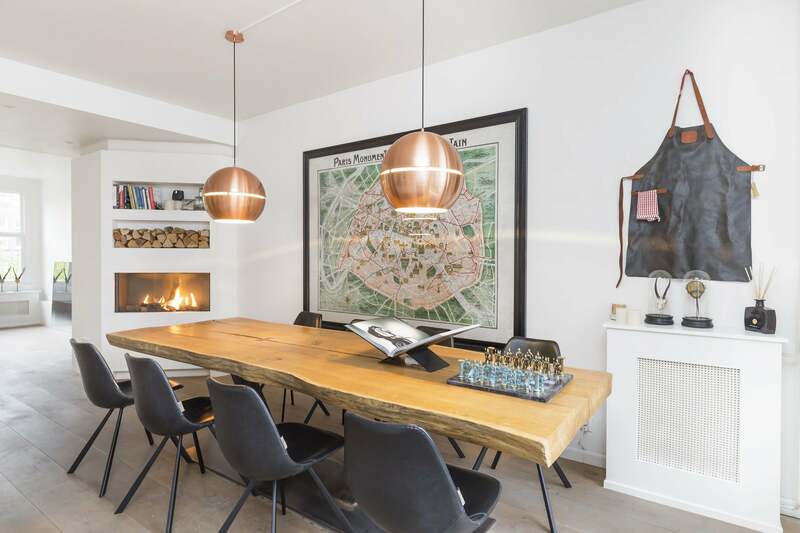 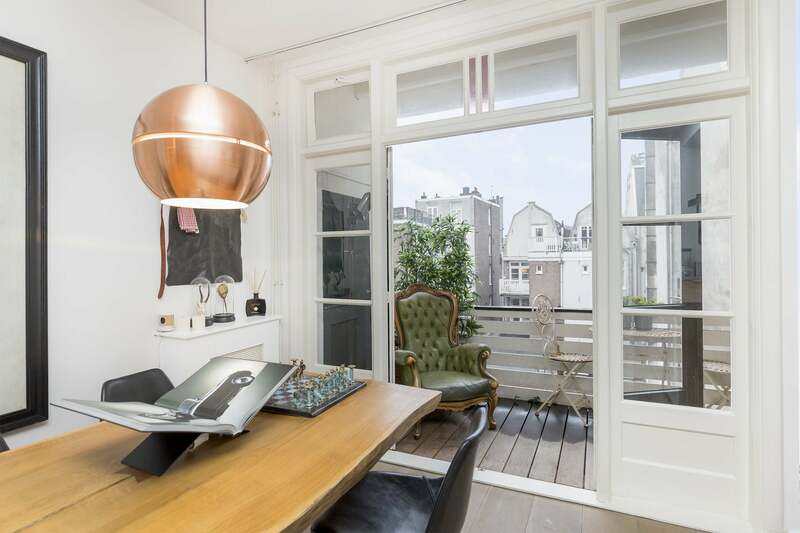 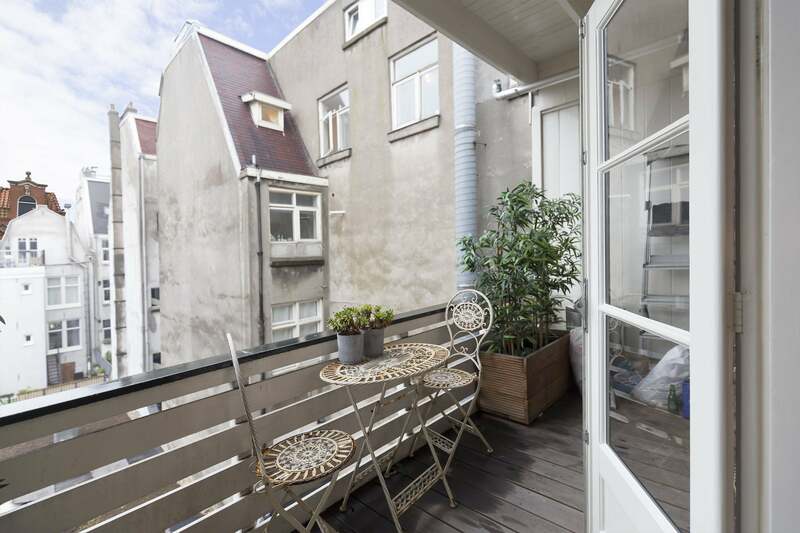 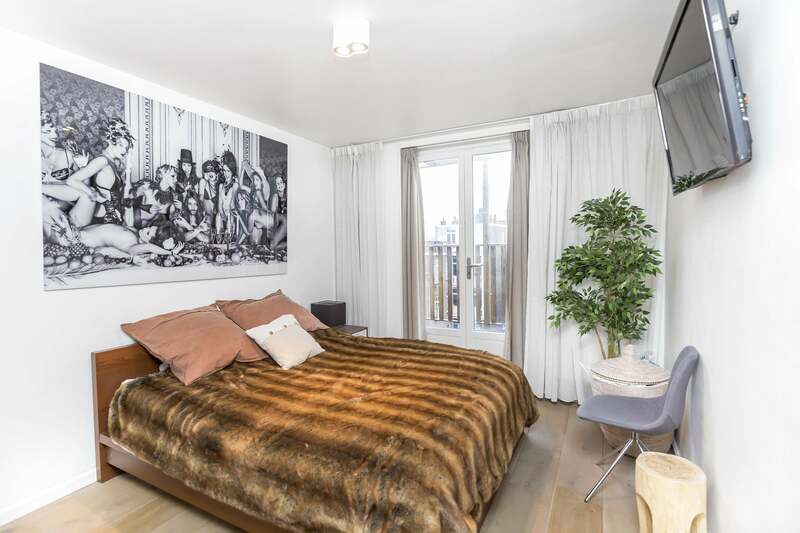 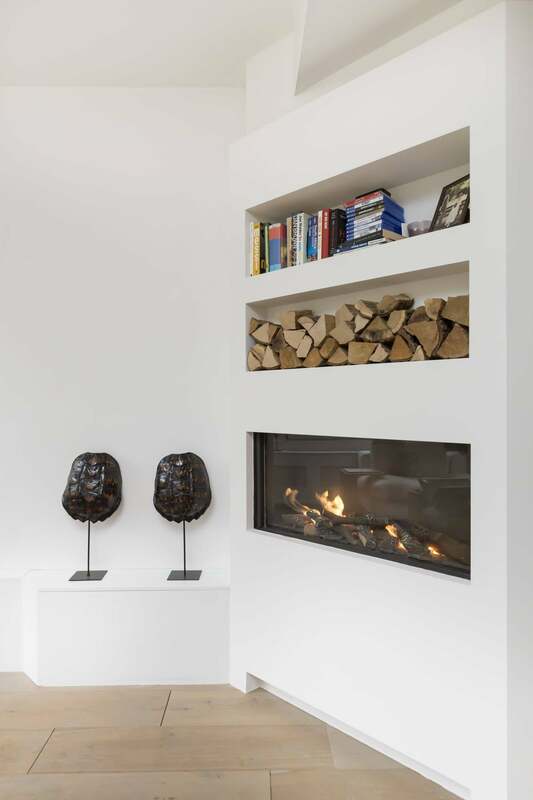 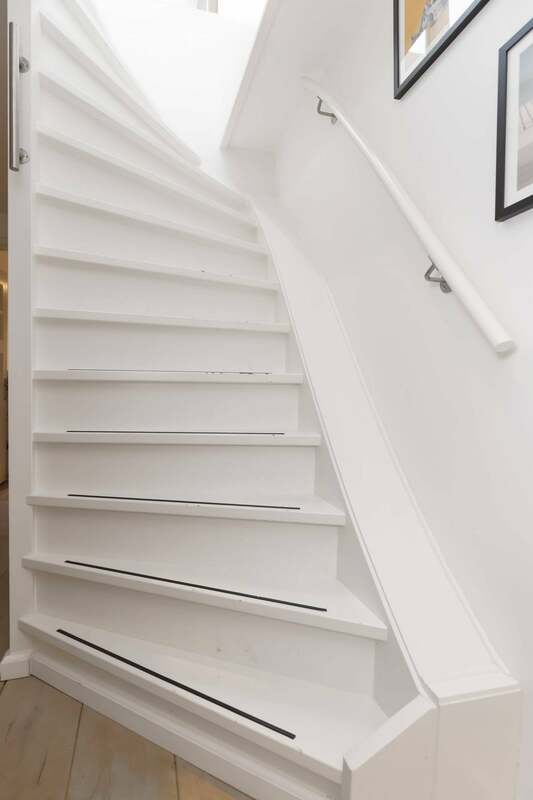 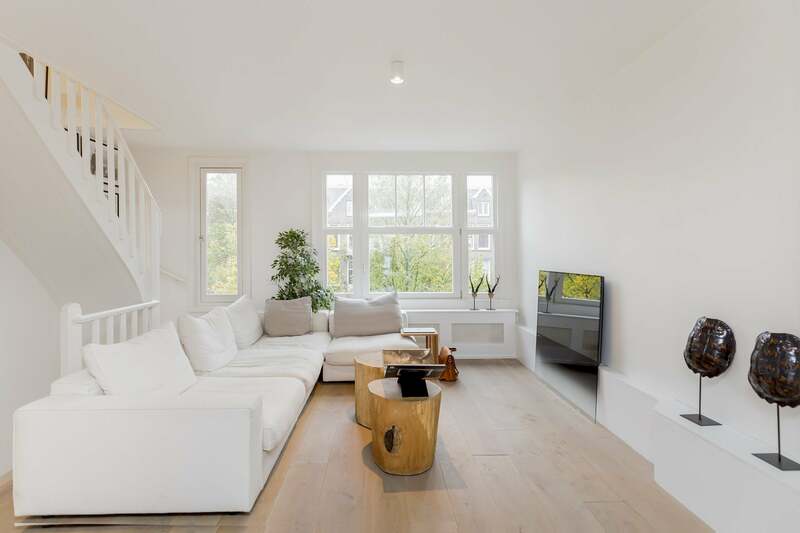 Blending a luxurious interior with a wonderful location within metres of the Vondelpark, this 3 bedroom, fully furnished apartment offers a memorable Amsterdam home. 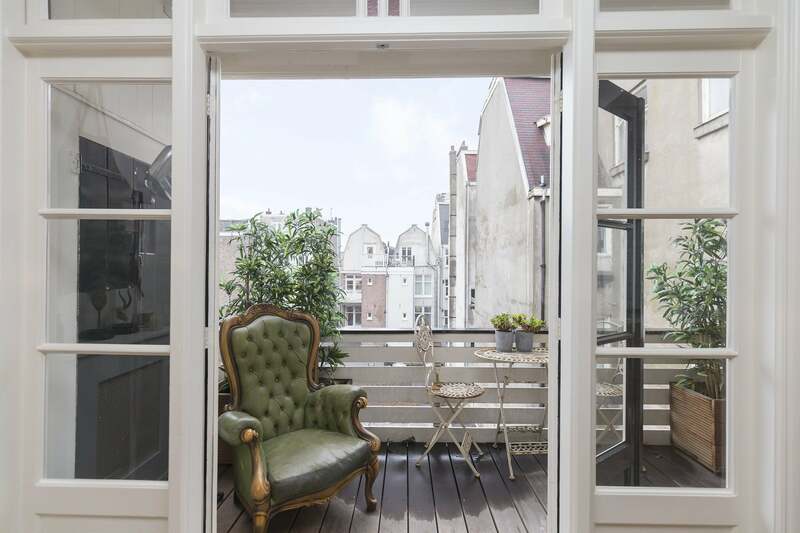 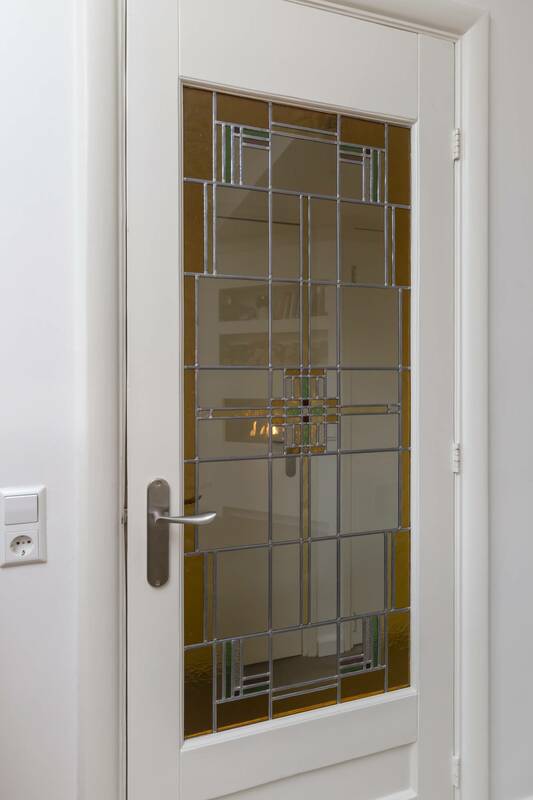 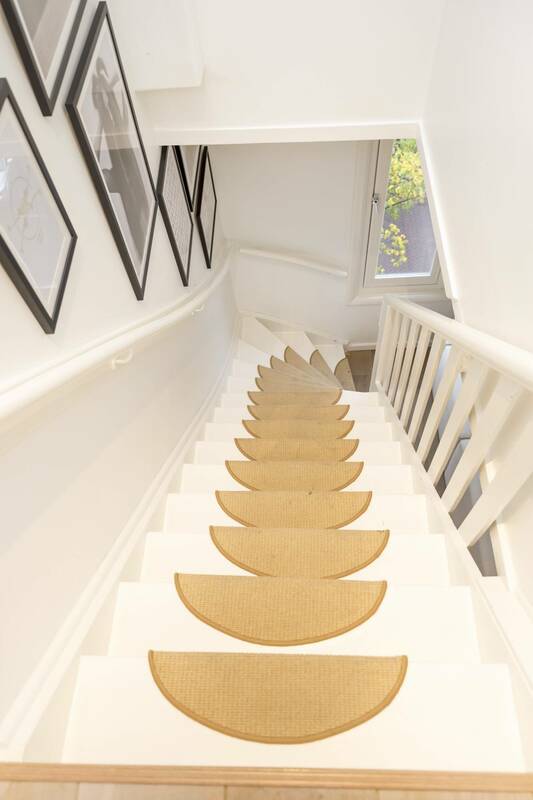 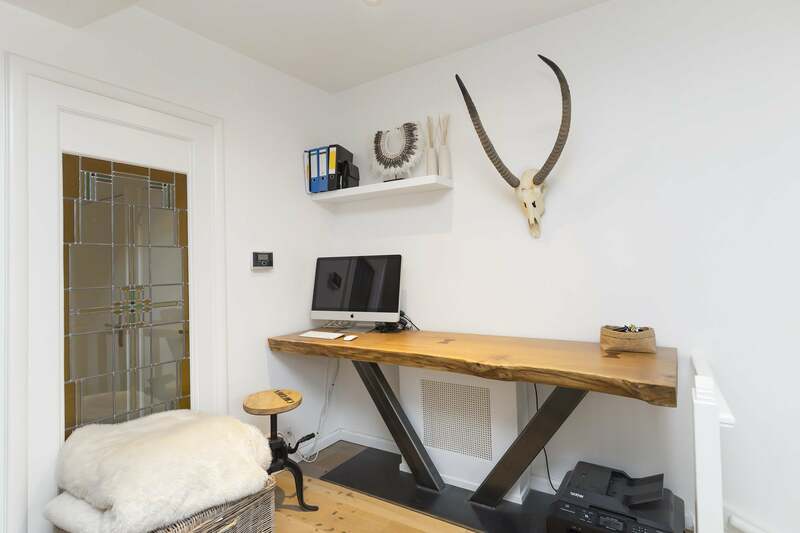 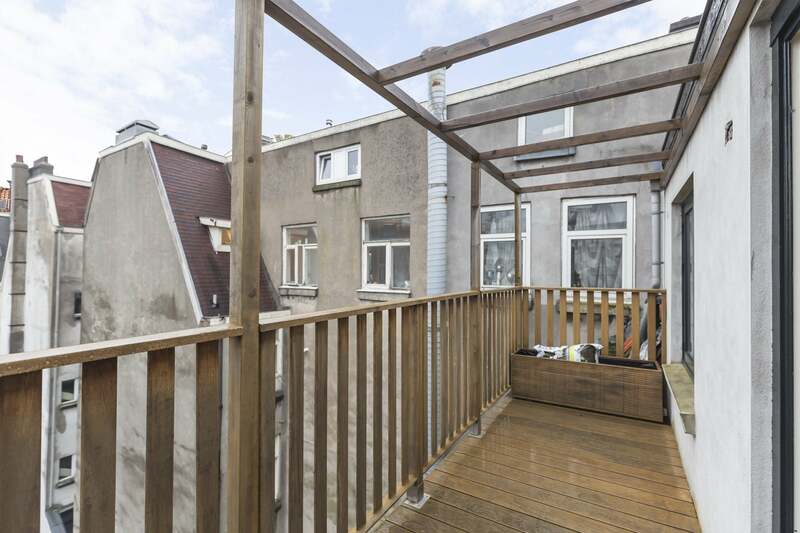 Boasting a roof terrace, 125 m², wooden floors, stained glass and unique design features throughout, this 3rd floor dwelling is certain to impress. 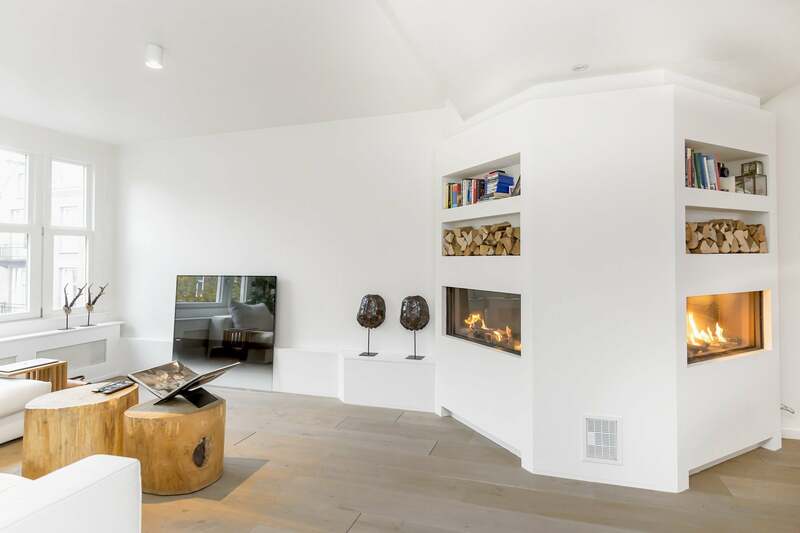 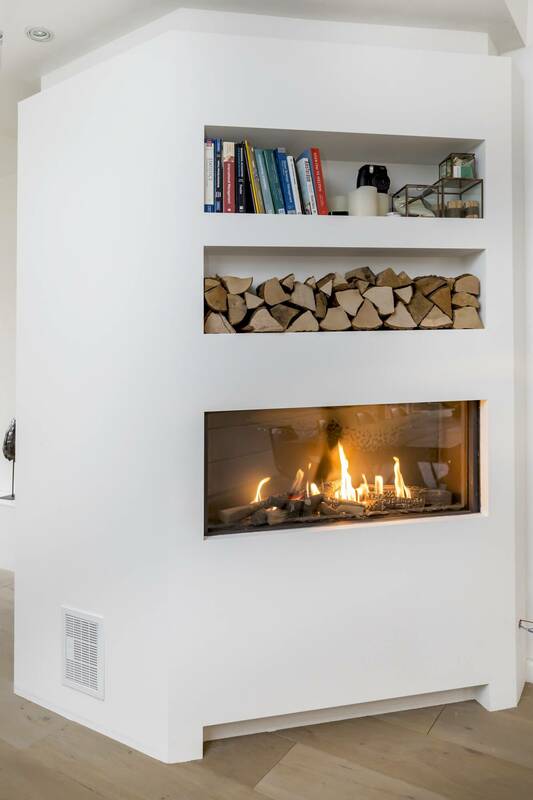 Sophisticated and soothing, the living area welcomes its guests with a sofa, TV, two handsome fireplaces and a beautiful bench/work space. 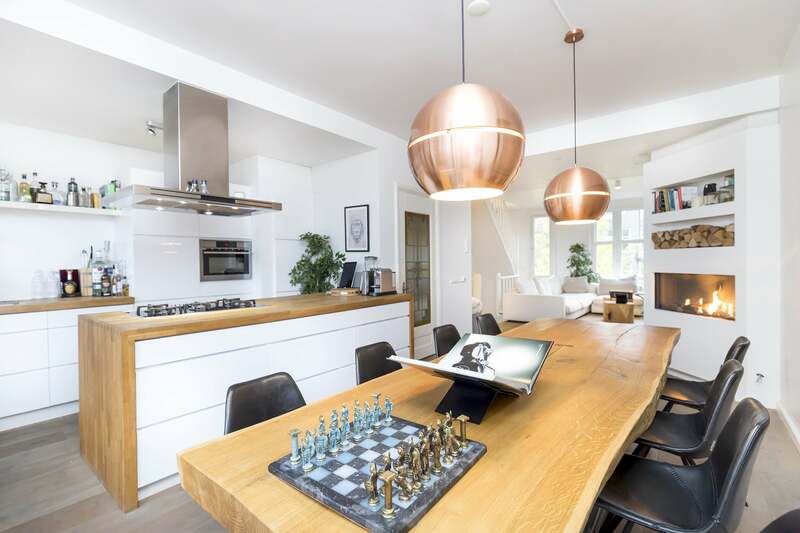 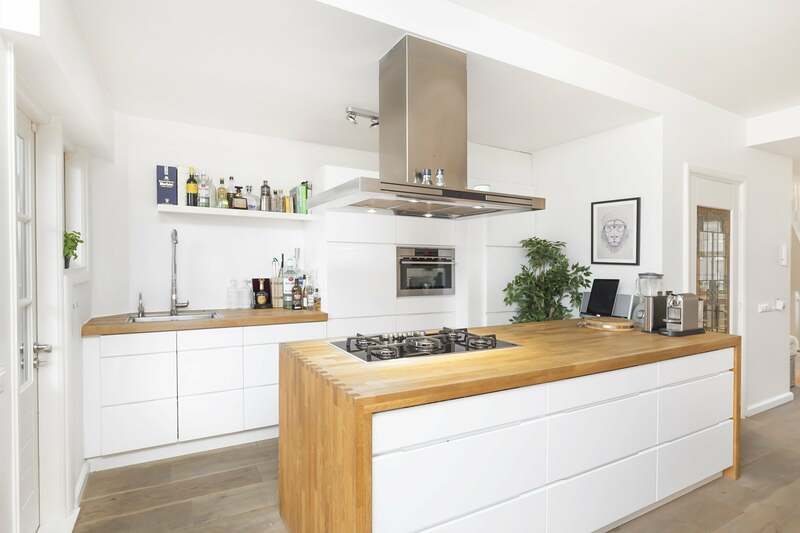 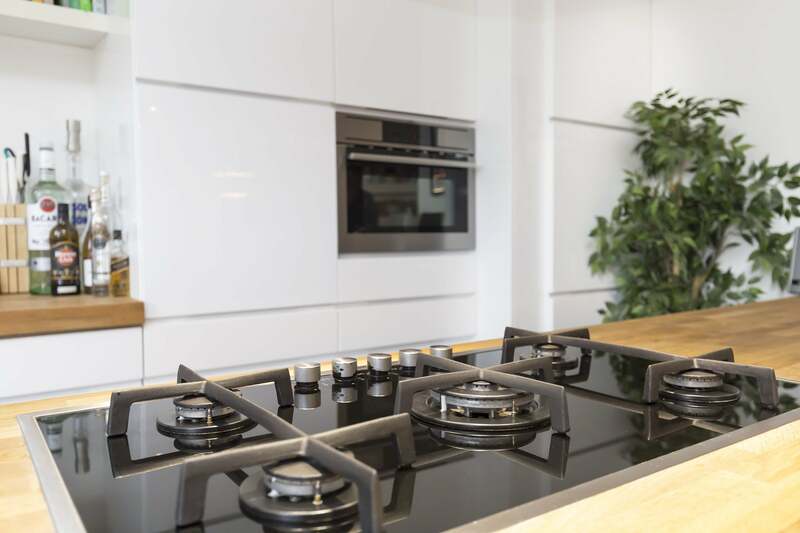 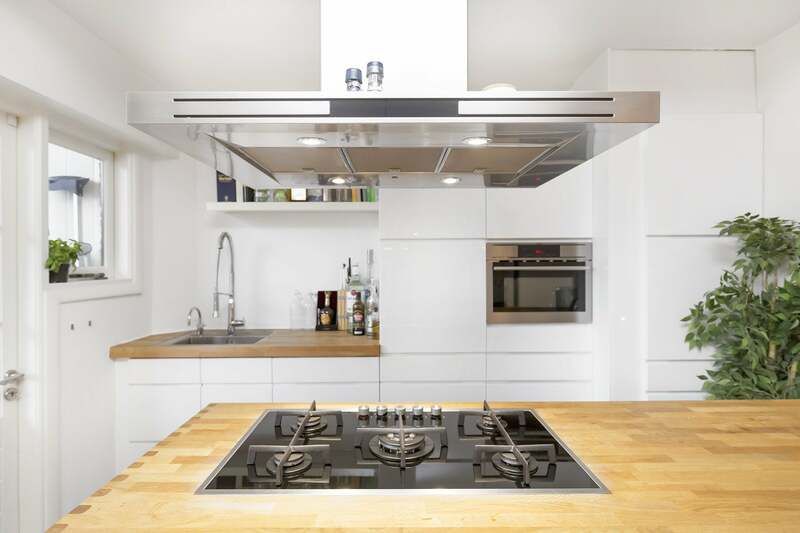 The open kitchen is equally enticing, providing all the essentials plus a large dining table and access out onto a cosy balcony. 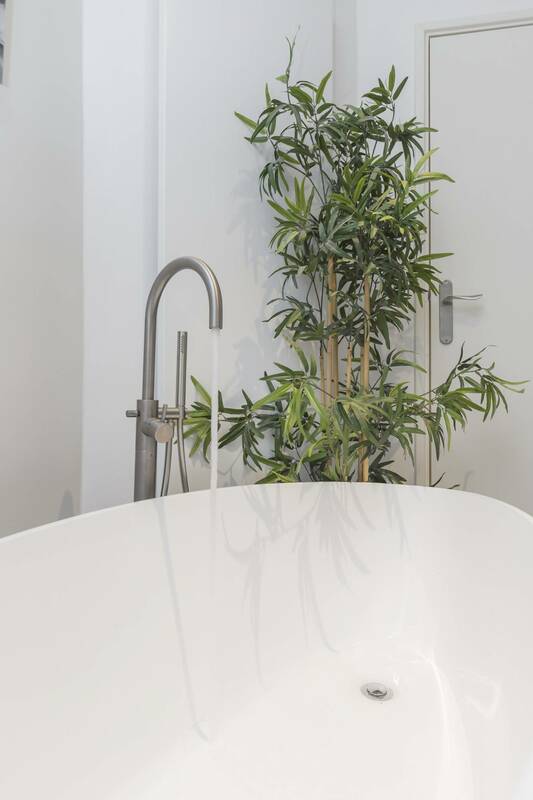 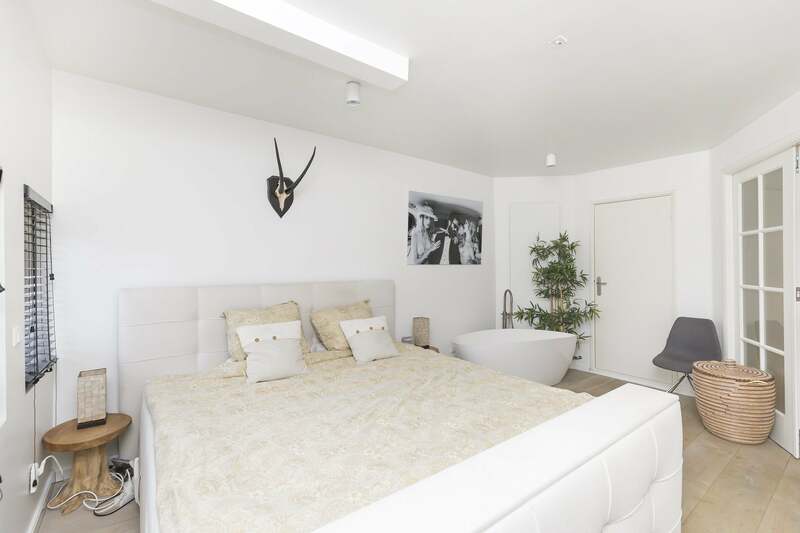 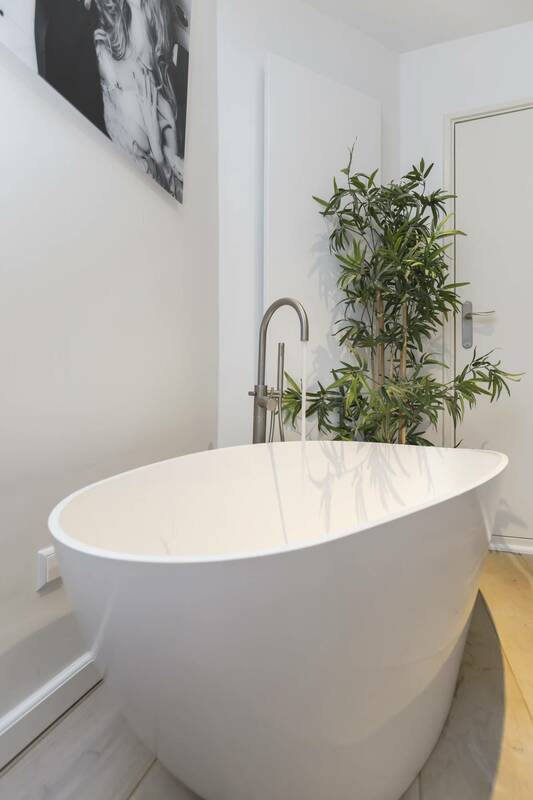 Housing a double bed, a gorgeous standalone bathtub, ample wardrobes and a secreted TV, the master bedroom definitely possesses that wow factor. 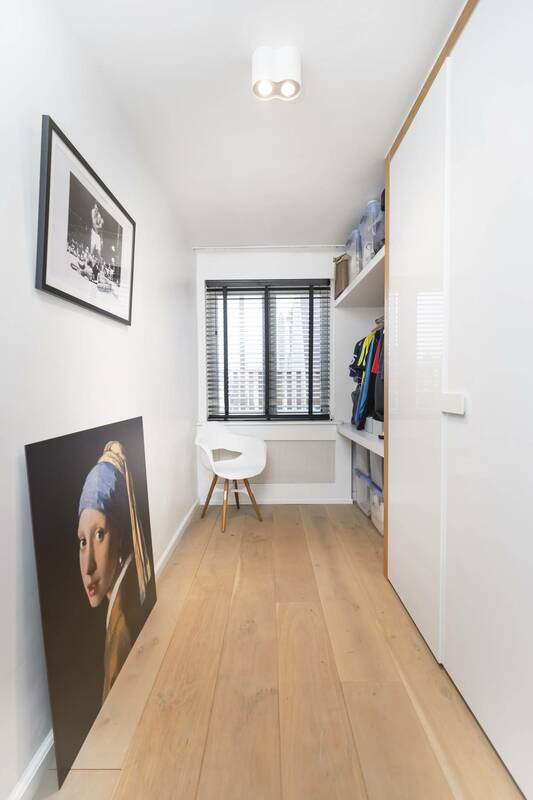 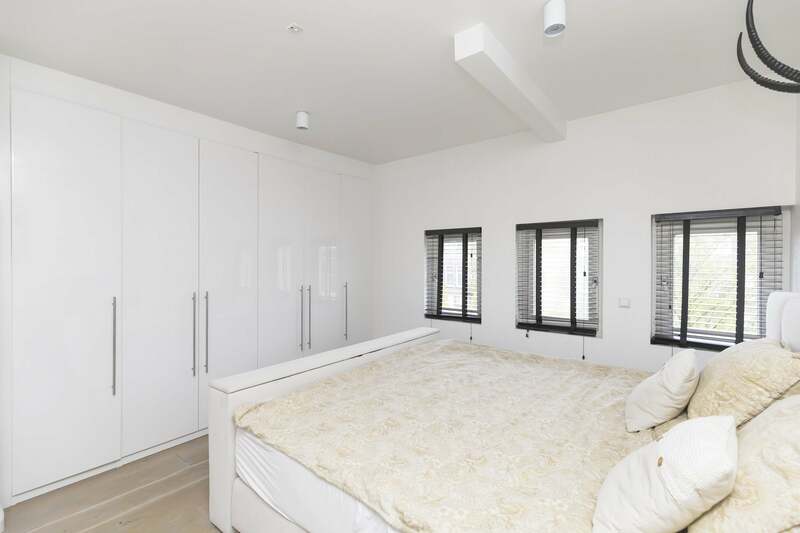 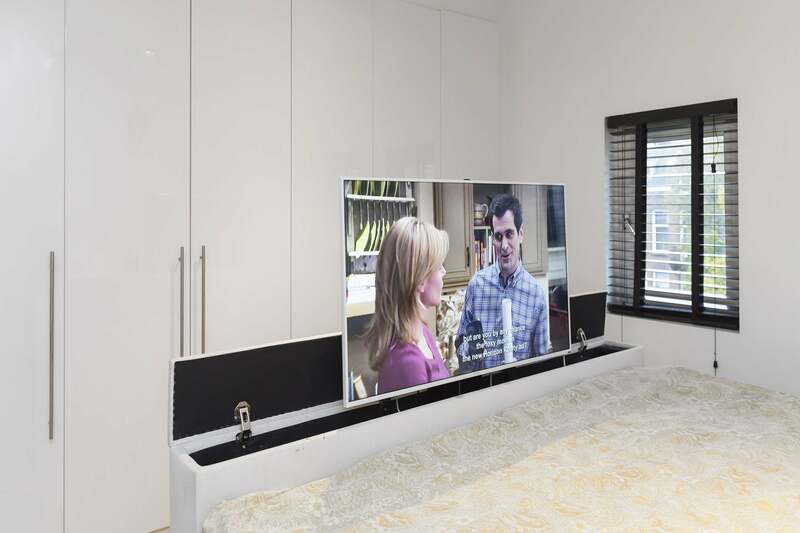 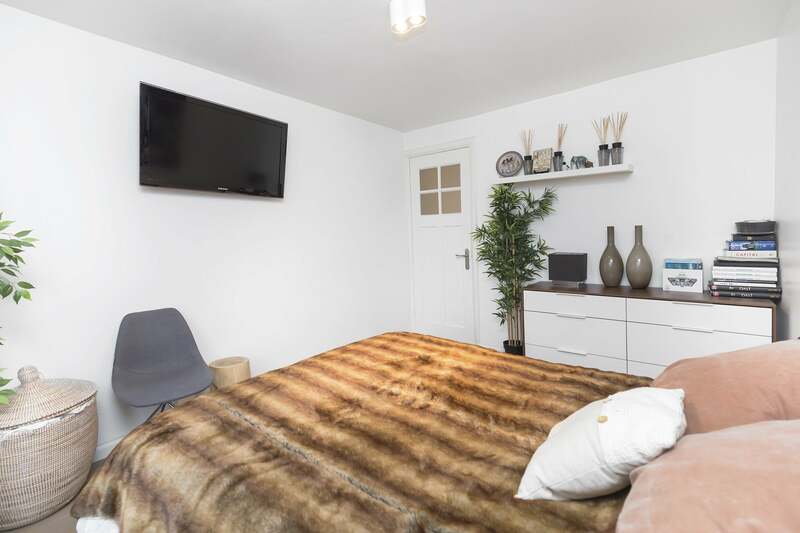 The second bedroom includes a mounted TV and a double bed, whilst the third bedroom makes the perfect spot for storage. 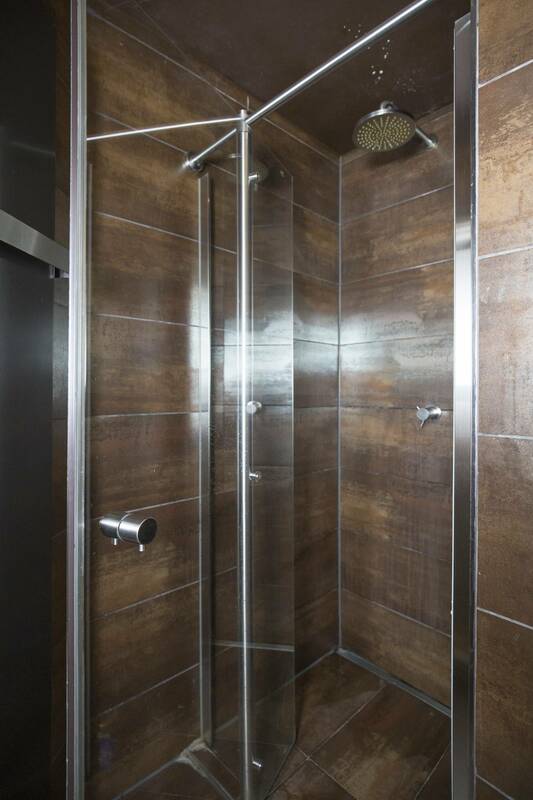 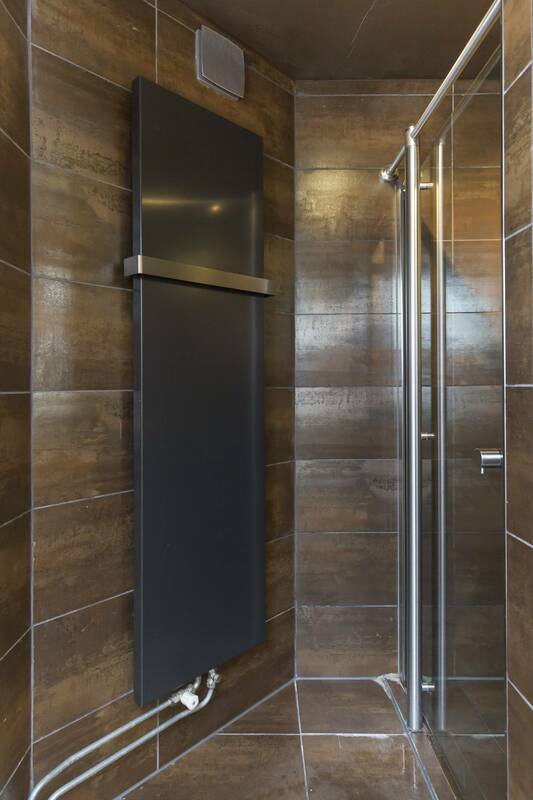 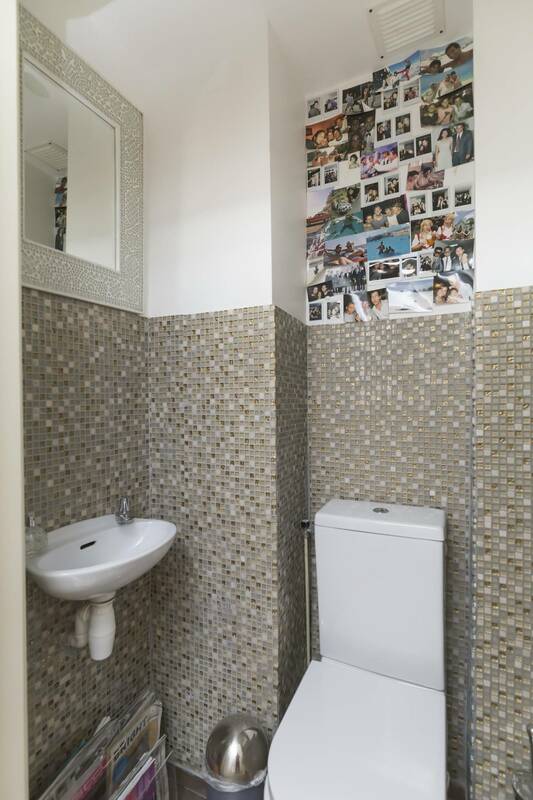 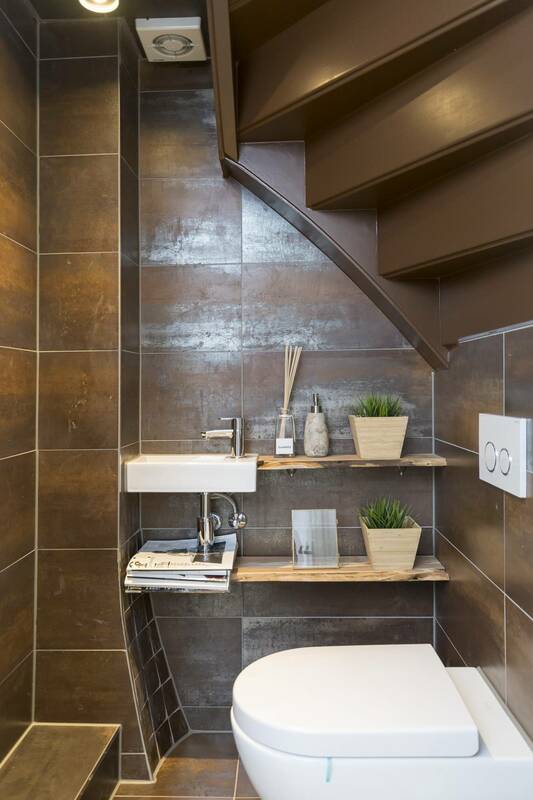 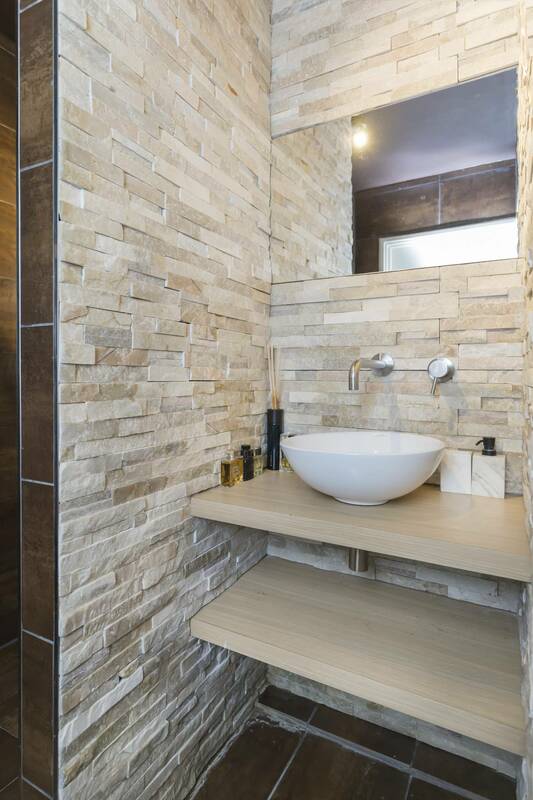 The bathroom contains a sink, toilet and a shower. 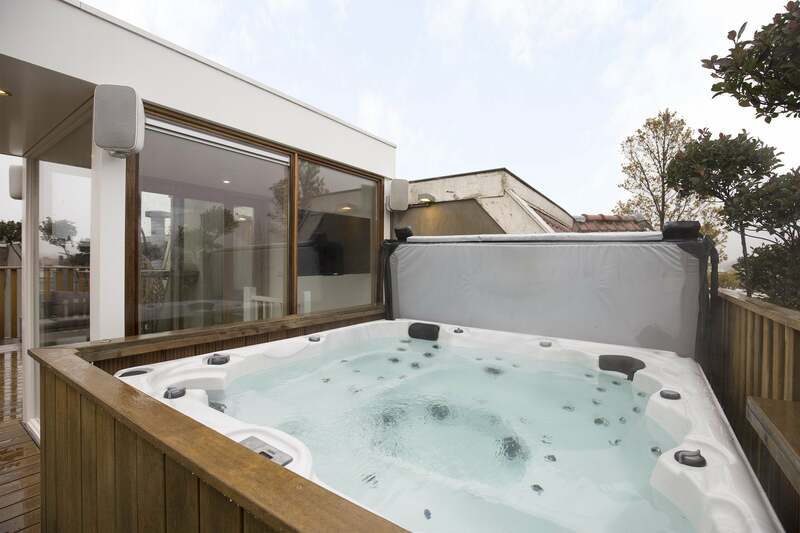 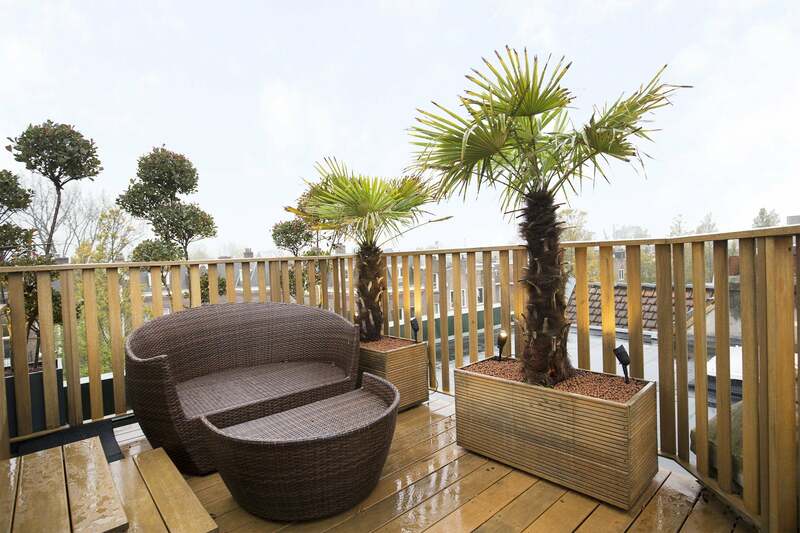 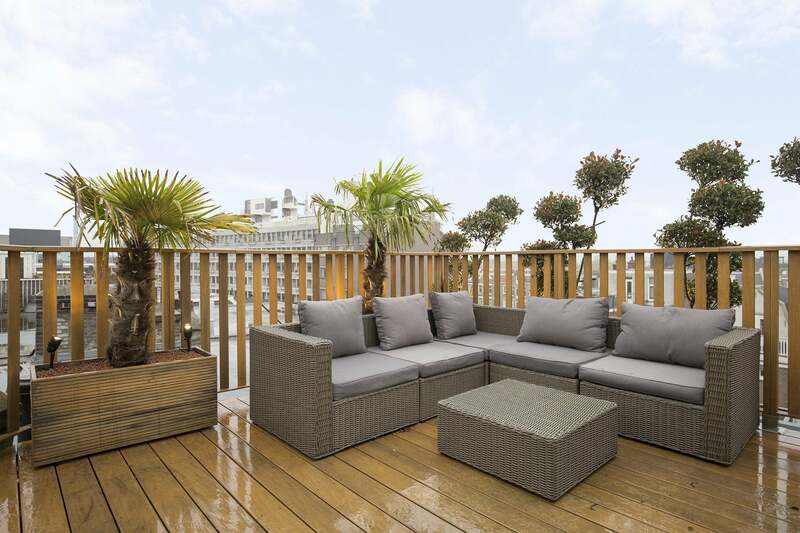 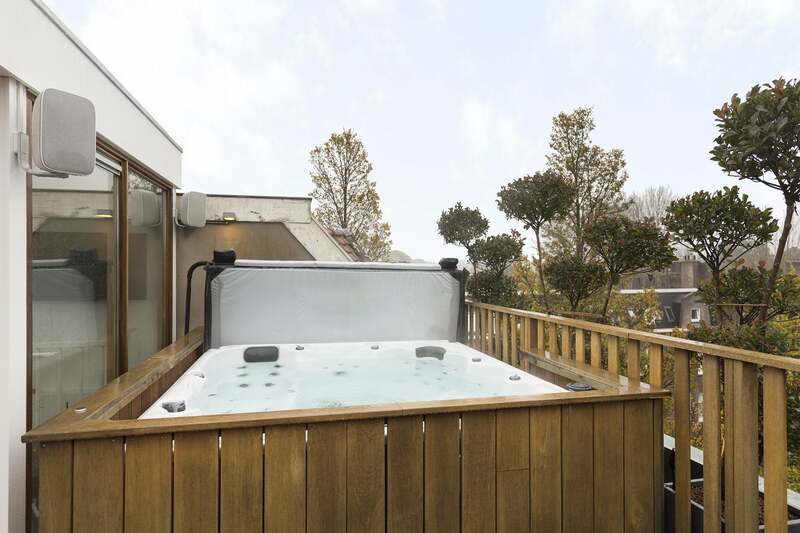 Occupying the top level, the roof terrace concludes the residence in style with its inviting seating areas and deluxe hot tub, which ensures complete relaxation after a busy day in the city. 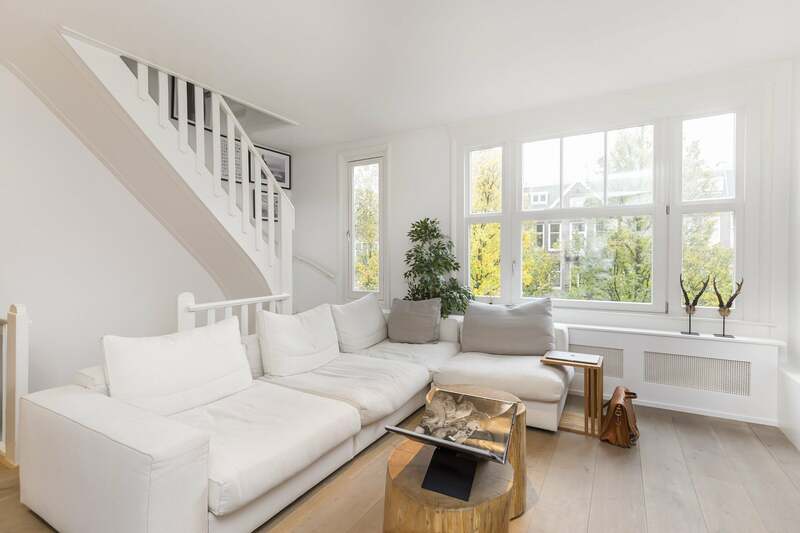 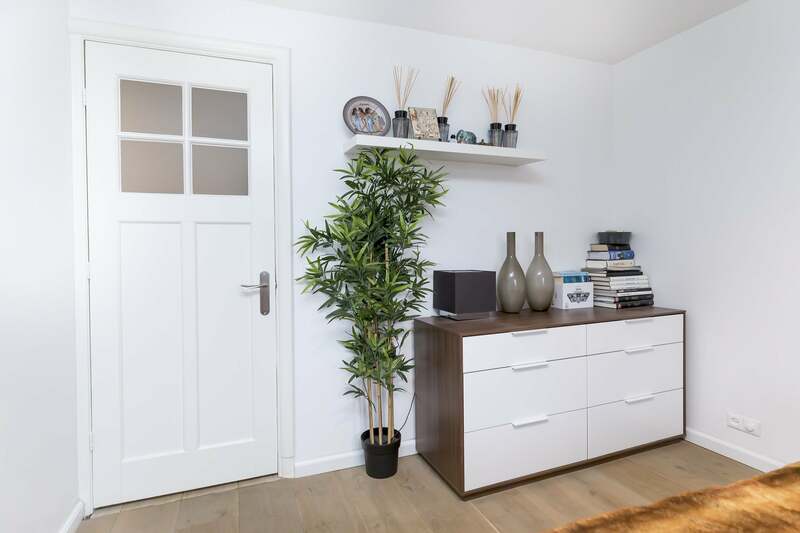 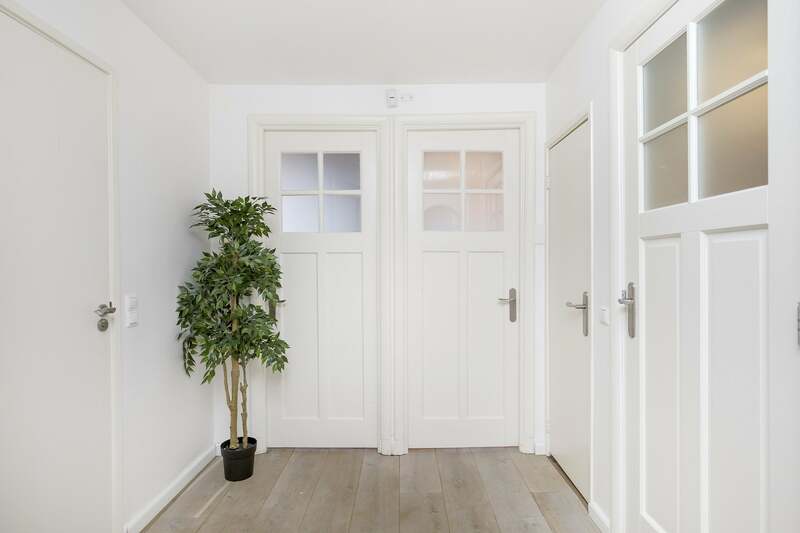 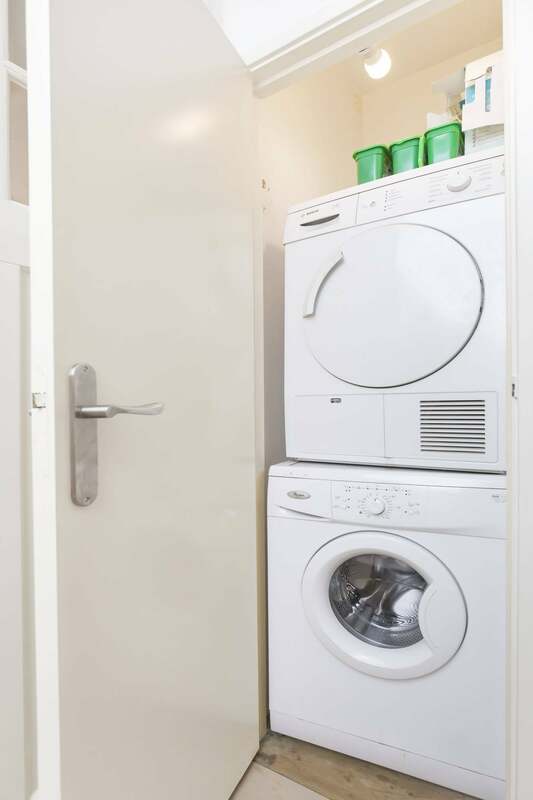 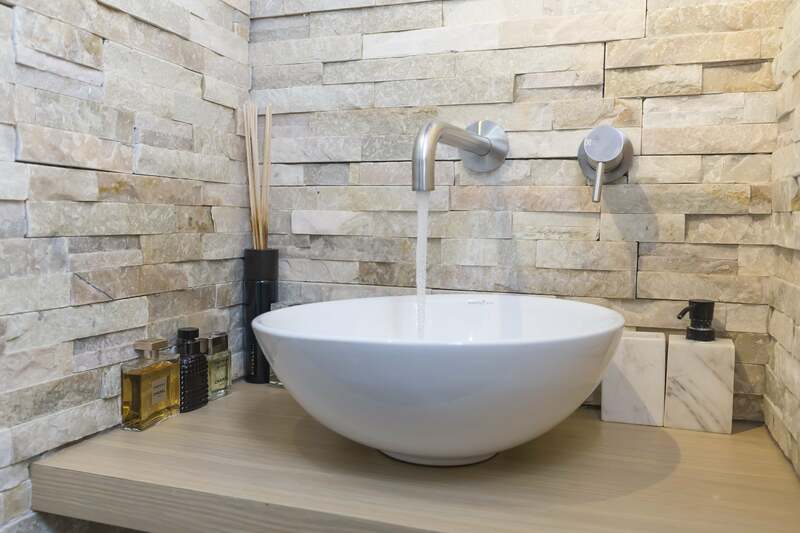 Residing less than 50 metres from Amsterdam’s most popular park, the accommodation combines its attractive interior with a desirable location. 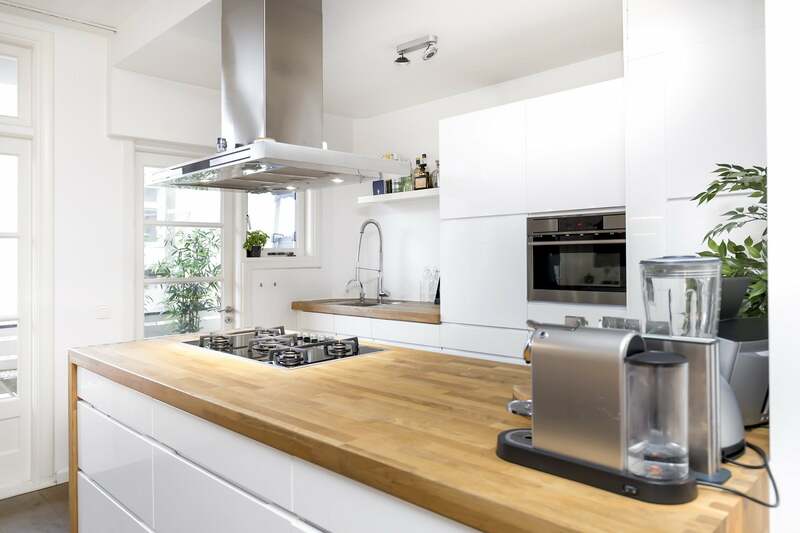 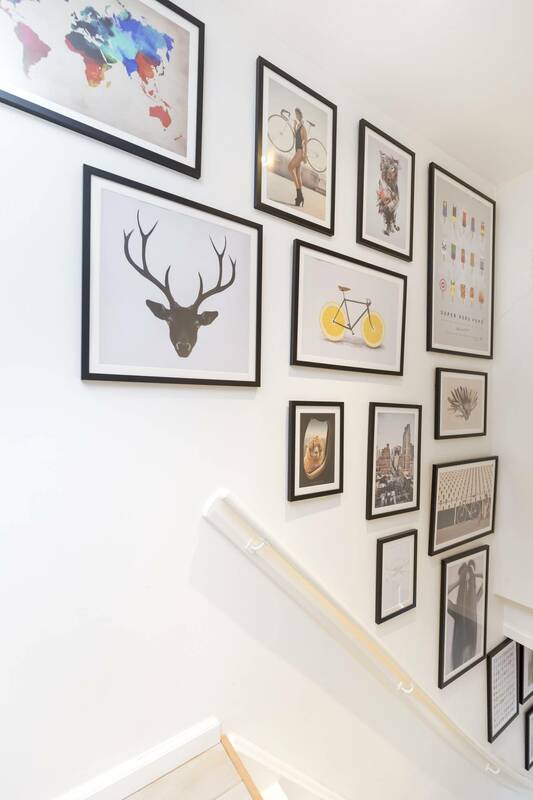 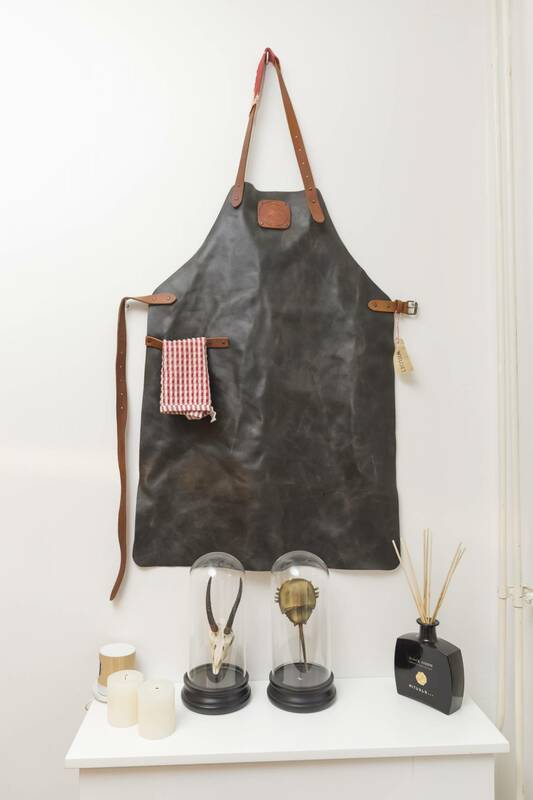 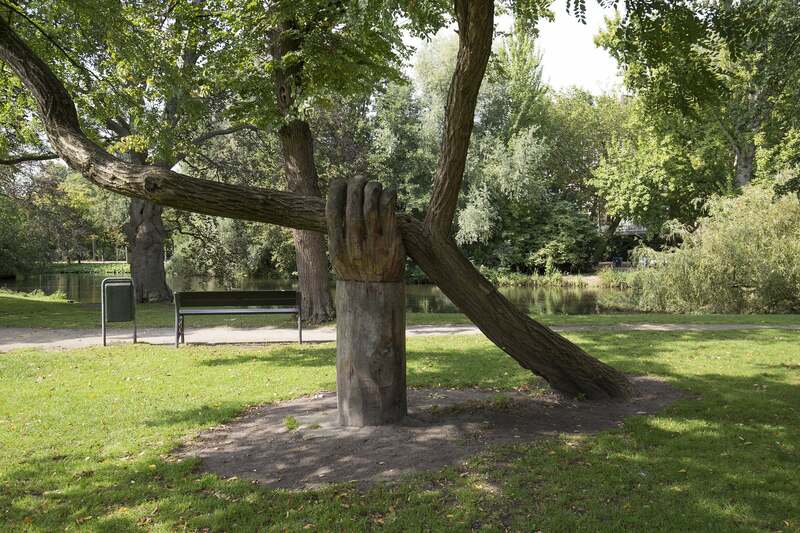 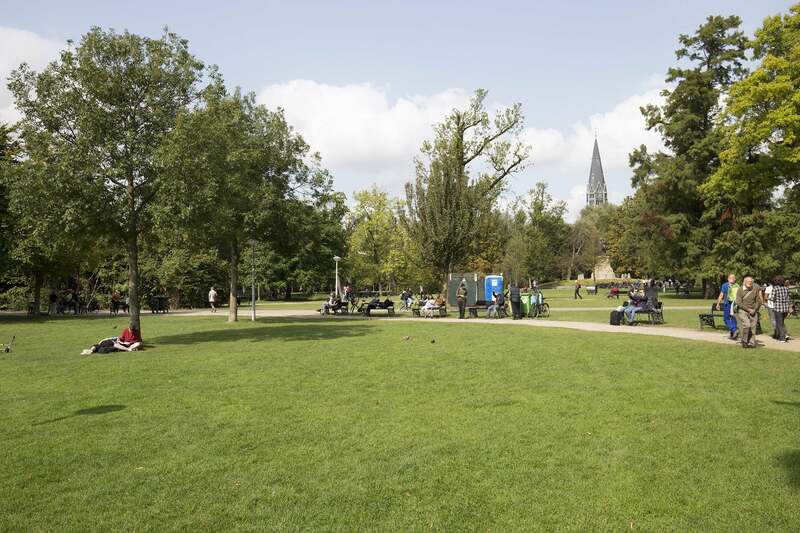 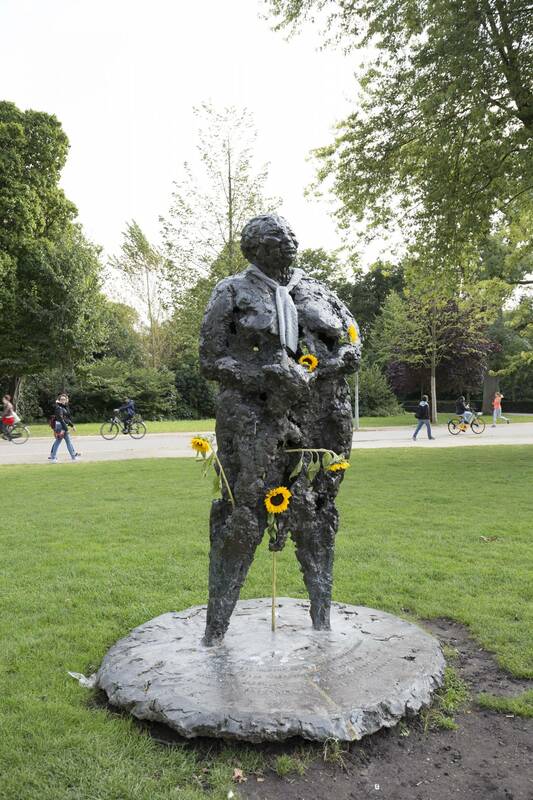 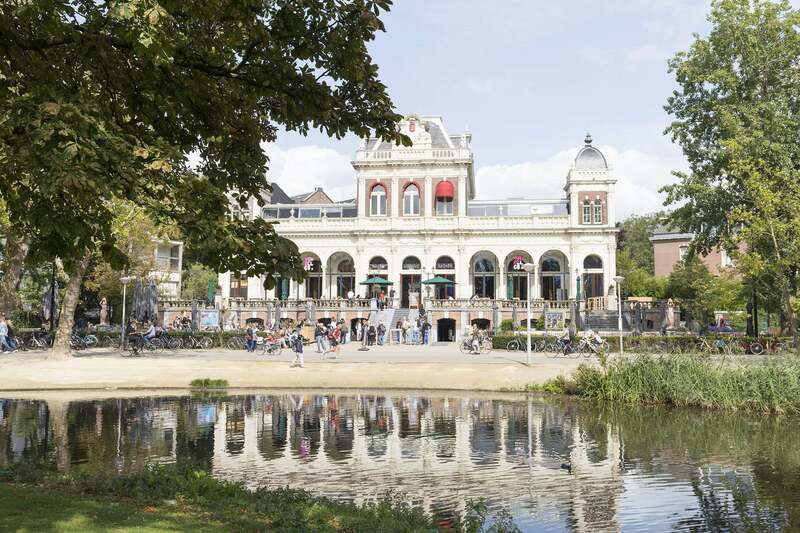 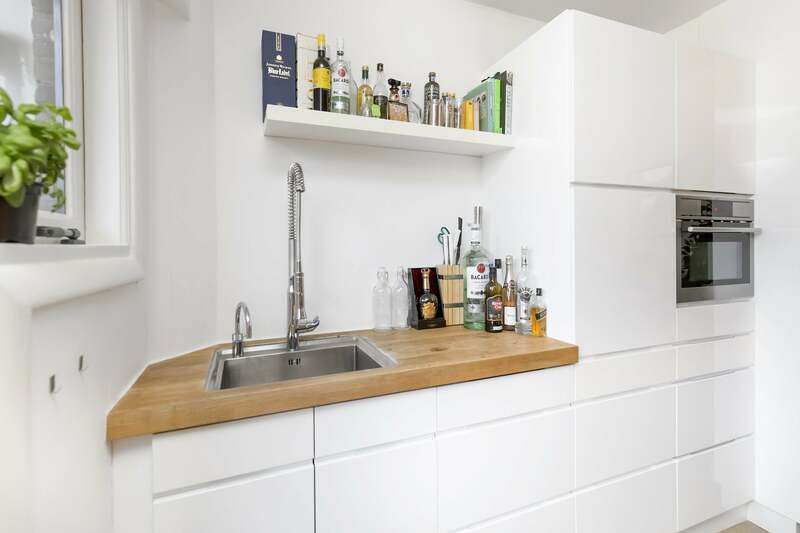 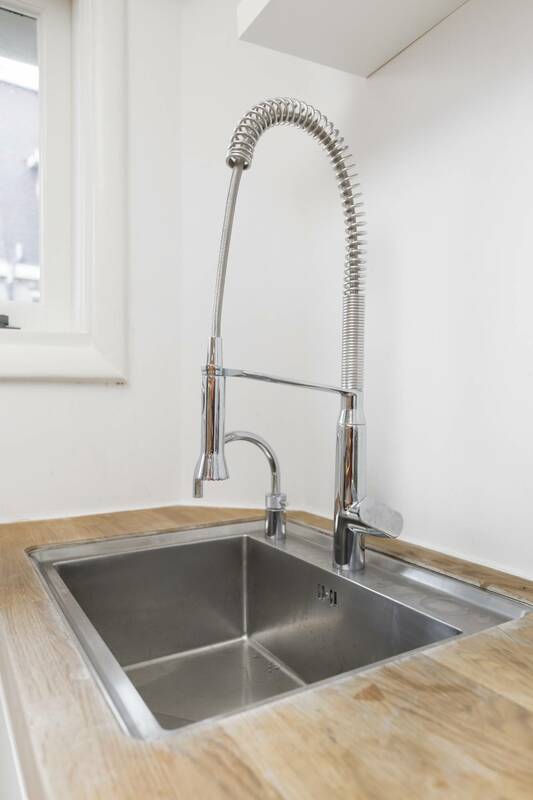 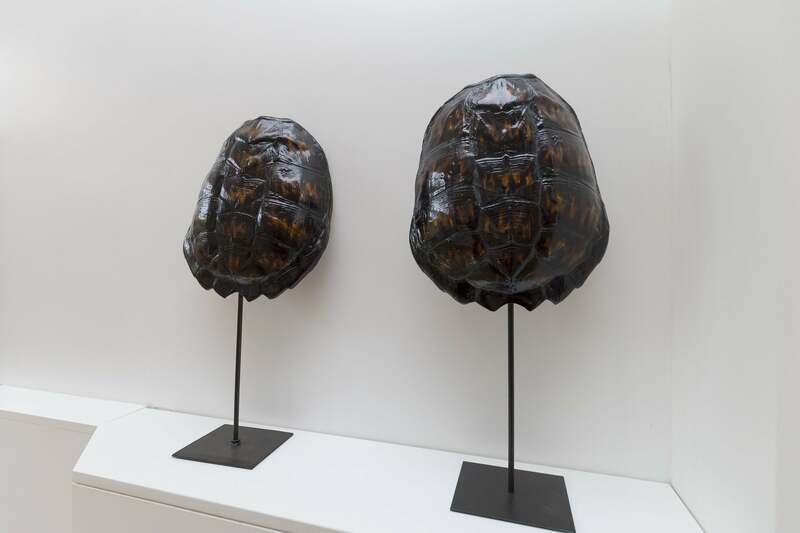 Aside from having the Vondelpark’s picturesque greenery practically on your doorstep, the apartment enables immediacy to a host of cafes, restaurants and stores, a variety of which can be found on the bustling Overtoom. 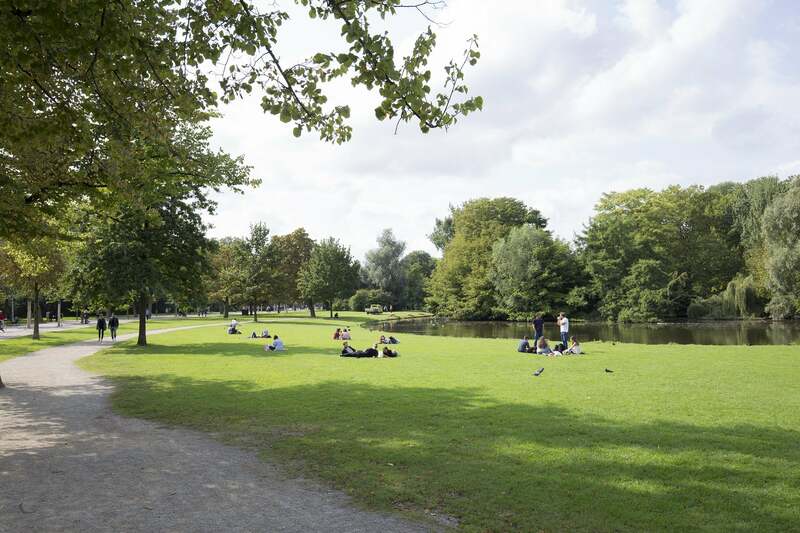 Public transport links are also close at hand, with the neighbouring tram link 1 allowing admission to the capital’s historical core in just 10 minutes. 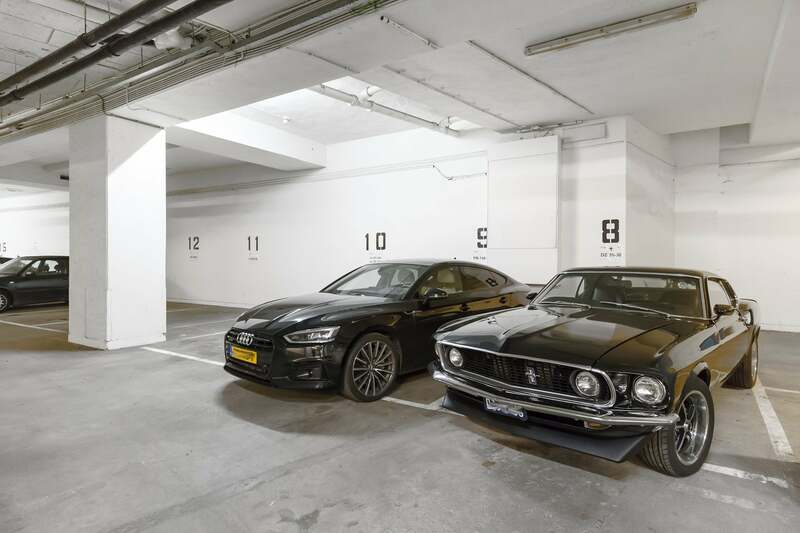 A private parking garage and instant access to Amsterdam’s central A10 ring road makes the lodging an excellent choice for car owners. 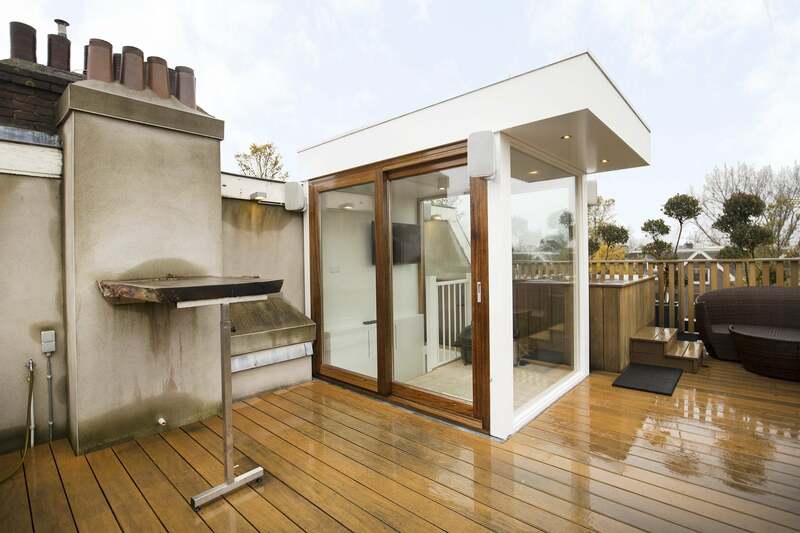 For the height of luxury in a superb location, book an appointment today to see the full benefits of this top class home!